Ellen Knudson is a book artist / designer producing handmade books under the imprint Crooked Letter Press. She is currently an Associate in Book Arts at The University of Florida. She holds an MFA in Book Arts from The University of Alabama. 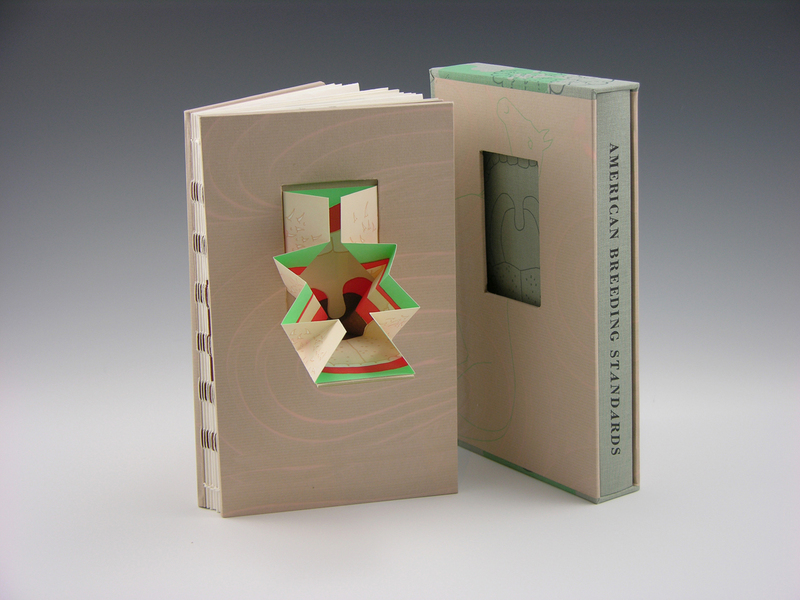 Ellen has been a book artist for 17 years and a professional graphic designer for 20+ years including graphic design positions at The Art Institute of Chicago and The Detroit Institute of Arts. She has taught letterpress printing and Book Arts at The University of Florida, The University of Alabama, and graphic design at Mississippi State University and Wayne State University, as well as letterpress & book arts workshops around the country. Her work is in the collections of San Francisco Museum of Modern Art (CA), Yale University (CT), The Library of Congress (DC), and many other national and international collections. Her most recent work is American Breeding Standards (2013). 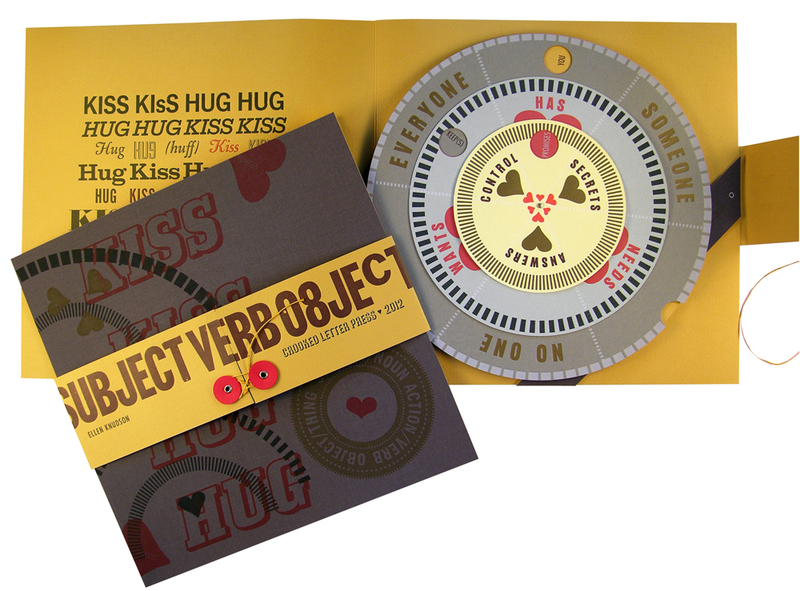 The work produced by Crooked Letter Press is the synthesis of images and words in the form of letterpress printed handmade books and printed matter. 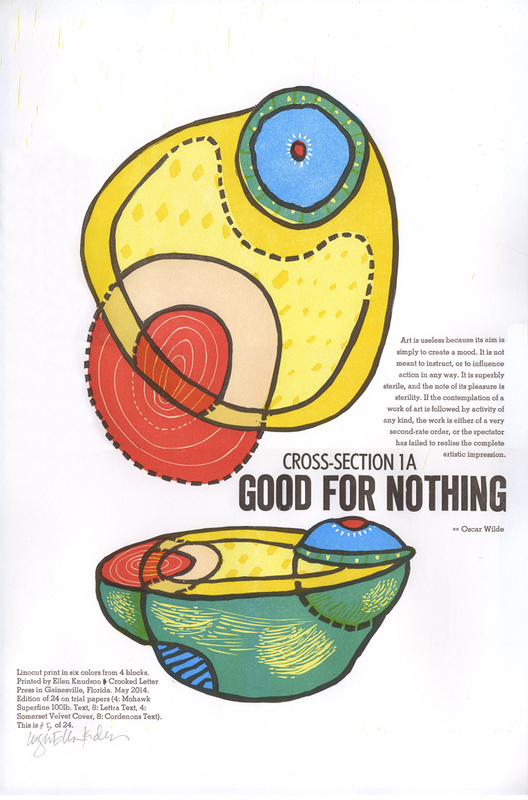 In all of the work produced by the Crooked Letter Press, a visual environment is created in which the reader/viewer is an active participant; the typography is to be viewed, the imagery to be read, and vice versa. The choices of text, imagery, materials, and binding structure are made entirely in support of the environment of the printed piece. What good is art? Why do it? These are questions I think about often. I worry about them, and then I proceed to make art anyway! The quote is from Oscar Wilde. It is the first part of a letter he sent to an acquaintance addressing the question of the uselessness of art. Subject / Verb / Object is a word game that grew from a need to process feelings of frustration concerning academic writing. The game has no beginning, no end, and no way to win. The turning, fitting, and order of words can lead to clarity or confusion. The reader plays with language and considers some of the options about what we all want, need, and have. American Breeding Standards explores the systemized rules about what comprises a good or bad horse, a good or bad woman undefined and the steps one might take to achieve the breed standard.